It looks like the sequel to Mirror's Edge may not be quite as canceled as we thought. 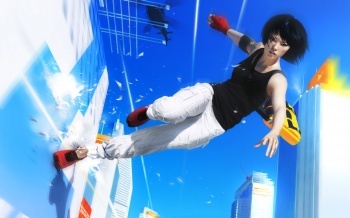 Swedish site Press2Play.tv reported earlier this week that the planned sequel to Mirror's Edge, the innovative but flawed parkour action game EA released in 2008, had been canned. EA DICE chief Patrick SÃ¶derlund said the game was close to his heart but hadn't sold very well, so the sequel had "stalled" and the people working on it had been reassigned to other projects. Today, however, things have taken on a bit of a different tone. An EA rep said in a statement sent to 1Up that Mirror's Edge is "an important franchise" and that the company has "nothing further to announce" regarding its future. DICE General Manager Karl Magnus Troedsson, meanwhile, made a rather caustic comment about the situation on Twitter, writing, "Fascinated how serious game media sites can stir up an article based on rumor milling, loose quotes and assumptions." It was also noted in the original reported that SÃ¶derlund said in an interview with a different Swedish site that EA was very much interested in making a sequel and that despite the difficulties with the first game, it still felt the franchise was worth supporting. It's not a definitive statement that we'll be seeing more of Faith in the future, but the simple fact that it's not as dead as we were led to believe is good news for fans of the franchise. Mirror's Edge was far from perfect but it was pretty damn good, and I'd love to see EA take another run at it.